Many feel this is a very old ring...sure hope they're right. Found in an area with a lot of old history. Wow, what a beautiful ring! It sure looks old to me. Very unusual design. Whoa that is amazing Keep us posted on details! It looks like eagle talons holding the stone- do the sides like feathered legs? Side view is not the best pic...sorry. This ring is not as gaudy as it looks in the pics and is actually quite impressive, at least my wife thinks so...she claimed it. WOW that ring is a looker Frank when did you find that?? 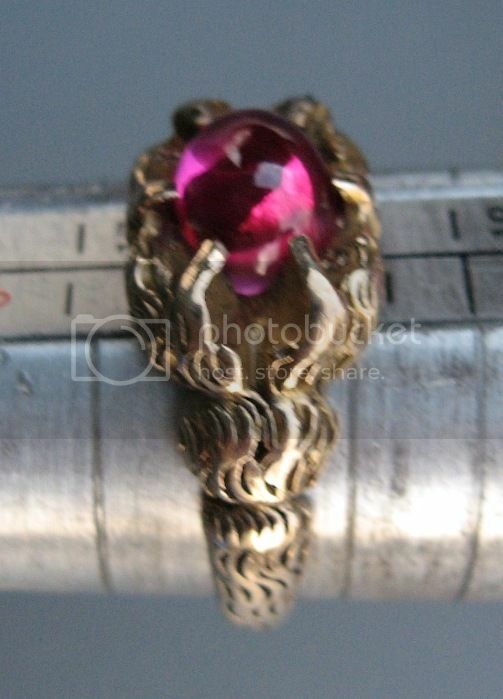 it really has an old feel to it , love the stone and type of setting is the stone faceted or a cabochon i can't tell from the pictures?? I found it yesterday Dan....very, very, deep. 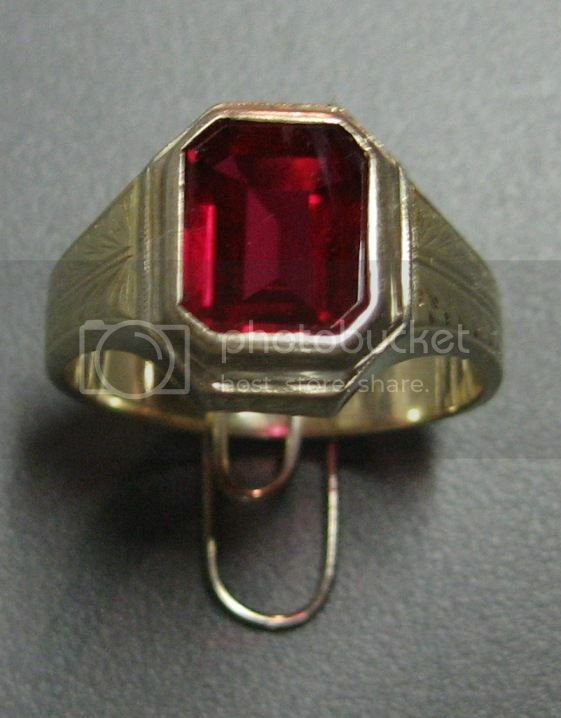 Craig said it's a Ruby in a cabochon setting. Craig knowledge with rings is like your knowledge with coins. Last edited by fsa46; 12-02-2013 at 06:58 AM. Very impressive sir! Quite a striking design. Land of Two Seasons - Snow and Fire Danger. Congrats, a very beautiful and unique ring! Now THAT is one Unique Ring!! Love it! Tell the wife you are offered $350 LOL! Always looking for that next ring !! That ring is gorgeous! Very unique! Congratulations! That is the kind of find I dream about! I believe this is the little gem Dan is referring to Stacey. I have hunted with Dan two times and he has brought me good luck both times. 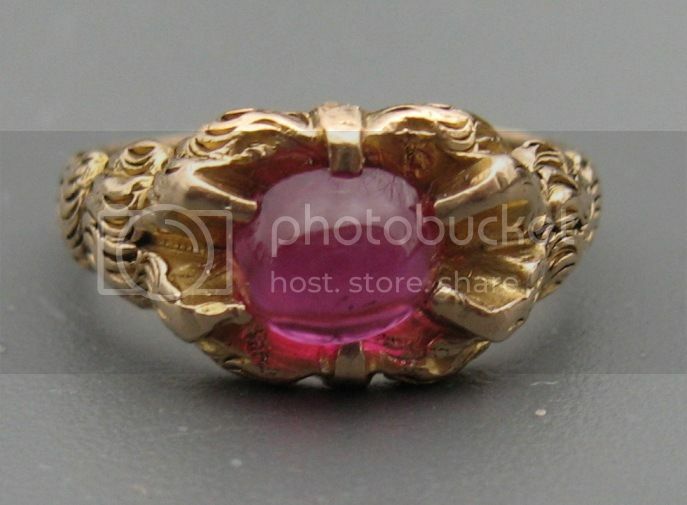 The 11 , 8 reale counterfeit cache ( that I'll never top ) and this ring. I should pay him to come hunting with me. Another beautiful ring! Hey, I might bring you luck too!! Take me! Now that's a cooool lookin' ring! Like the others have said, it's a very unique design! Very cool! That ring is definitely a beauty a huge congrats on that one! !